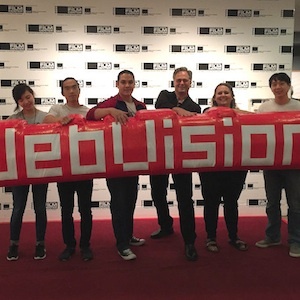 We just put the 3rd Annual WebVisions Barcelona conference to bed, and what an event it was! This was one of our best line ups of speakers to date, and we managed to cover a multitude of topics relevant to the day-to-day lives of creatives around the world. The response from the show and hack happiness events were overwhelmingly positive (thank you), and we look forward to doing it all again next year. 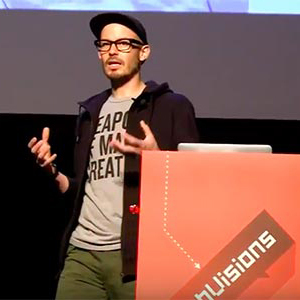 I recently attended the 3rd WebVisions Barcelona event, and this year’s theme was ‘Hacking Happiness’ – aiming to highlight how happiness is important for our relationships, work and communities, and how it directly affects our creativity. The various intimate spaces in the thoughtfully designed modernist venue of the Institute of Educational Design set the tone for the conference and felt appropriate for the 140 attendees. The multitrack first day of workshops got off to a great start with an engaging session on ‘Temporal Prototyping’ by Jason Cranford Teague . His approach to designing as soon as possible using prototypes (with actual code) was refreshing to hear, as this is something we try to advocate in our own work at Clearleft. 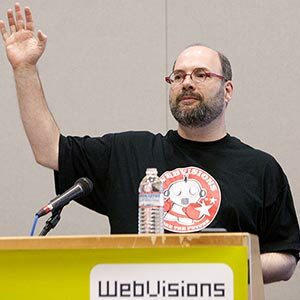 Hearing his war stories and those from other attendees on the pitfalls of pixel perfect designs that were unable to be implemented was a cautionary reminder to focus on the fact that design is as much how it works as how it looks. I left with some new ideas on how we can streamline our own prototype processes and a few great tools to help us get there. Days 2 and 3 saw all the attendees back together for keynotes and sessions in a suitably low key auditorium. Mona Patel explained in great style her approach to personas within our own teams at work; key types, the implications, and the advantages and disadvantages. Being honest with myself, it turns out that I’m often a ‘Brat’; one who is quick to make decision based on their experience (a plus! ), but this can sometimes lead to dismissing radical alternatives too soon (ahhh!). Saying ’no’ too quickly sometimes? Something to work on I think…. Using personas within the design field is commonplace, but this consideration of how our own personas can affect our output and ideas is really interesting; her new book ‘Re-Frame: Shift the way you work, Innovate and Think’ is one to be passed around the office I think. The focus on happiness playing an integral part in our work/life balance was also encouraging; ‘Happy People do it Better’ summarises this perfectly. Carolyn Chandler encouraged us to ‘burn down the blocks’ and ran a session on ‘sparking collaboration though interactive play’. The collective output saw some interesting ideas on how to enable drunken pirates to sing dirtier songs (all in context I assure you!). However Carolyn’s message was that by defining yourself and your team members by roles alone e.g. developer, designer, the opportunities for creative thinking are already limited. One person, one role is a potentially narrowed mindset but involving a team in a discipline-agnostic way when tackling a problem helps combat this. This is certainly an approach we have adopted where possible, but perhaps this is a good reminder to try and ensure this is the norm on every project. One of the stand-out talks of the conference for me was given by Jason Lengstorf on work/life balance and productivity; ‘Happy People do it Better’. It turns out that in terms of productivity, after 19 hours awake you may as well be drunk (Jason assured us actual research has been done!) which places an interesting spin on ‘being a trooper’ and working long hours every day. He cited a number of companies which go to lengths to ensure their employees stay happy and motivated as a result; paid holiday incentivised by NOT checking your emails anyone?! Fortunately work/life balance is something taken very seriously at Clearleft, and with it the trust that comes of allowing experienced people to do their jobs in the way they see fit. Hopefully with more people like Jason spreading this message, balance in our lives is something that will continue to be encouraged throughout the industry. Javier Usobiaga and Marta Armada broached the somewhat tricky subject of ‘How to be the Best Web Designer in the World’. Arguably not something easily achieved (at least not for mere mortals such as myself), but Javier and Martha’s message is how to focus on work in midst of the digital noise that surrounds us. Poor concentration, over stimulation and ‘plugged in compulsion’ are apparently all classic symptoms of ‘Information Fatigue Syndrome’; certainly some of those ring a bell! Their approach is to try and distance oneself from the noise; bookmarking items for consumption later (or never! ), trying only one new language, tool or technique at a time, and having realistic expectations from a project outset. Their idea of MDR (Minimum Decent Result) is a dig at the acronym de jour, but perhaps something to consider when stepping back and being objective about a project; building on minimum deliveries rather than struggling to meet unrealistic ones seems a good place for any project to start. Gastón Lisak from Fabrica delivered an engaging talk on projects that make him happy, and how important his ‘side projects’ are to his work/life balance. NoAA Ilani urged us to ‘Rethink the brand experience’ and focused on how a brand’s core intent should be at the centre of building an engaging experience for users. The final keynote was given by Stefan Sagmeister on ‘Design and Happiness’. 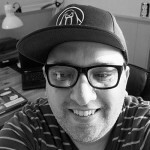 The work he has been doing in this vein is well known over the last few years, and his studio’s extremely successful design shows have helped highlight this. However, I was fascinated at the scientific research that his work is based on; amongst numerous statistical reasons that we have to be happy (and how we can strive to be if we’re not), Stefan encouraged us to do something meaningful and non-repetitive in our and work and daily lives to this end – points well noted! A rousing group singing session led by Stefan (yes, just like it sounds…) ended his talk and was a great way to round up the conference. 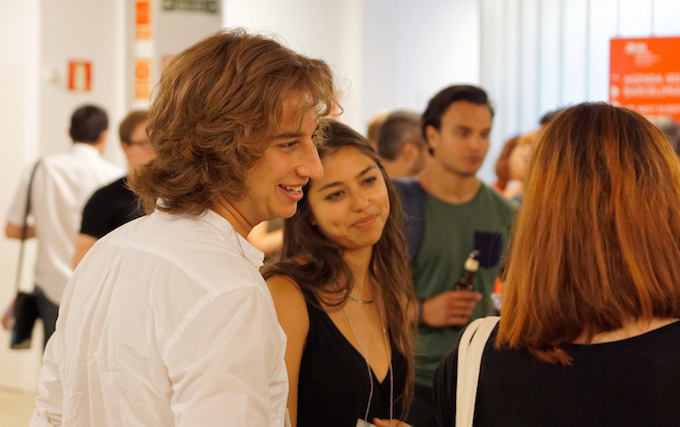 I was really taken by Webvisions; beautiful city, weather and friendly people aside, the conference had a good balance of practical approaches and thought-provoking ideas; a great curation job by organiser Brad Smith. The focus on happiness playing an integral part in our work/life balance was also very encouraging; ‘Happy People do it Better’ summarises this perfectly. We saw some inspiring work that clearly took a lot of effort to produce, but by people who did so with (mostly!) smiles on their faces. This is something to bear in mind when tackling difficult challenges; I’ve certainly come come away with an enthusiasm for how I approach my work and I hope the same goes for the other attendees. Reprinted from Ben’s original post, Webvisions, Barcelona – A Happy Review, published on Clearleft’s website.